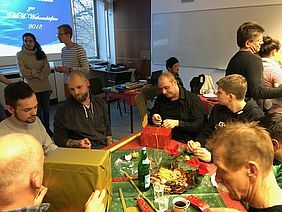 On December 20, 2018 we celebrated a tradition and looked back at a successful year 2018. 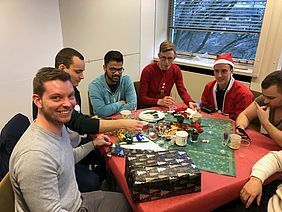 Starting at 3 pm on December 20, 2018 our traditional Christmas Party took place in the IMM Seminarraum. This celebration would not be possible without our fantastic colleagues, friends and sponsors and their contribution of mixed dishes. 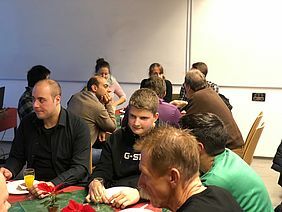 This event covered various conversations with the participating guests, secret santa gifts exchange, games, and a visit to the Aachen Holiday Market. 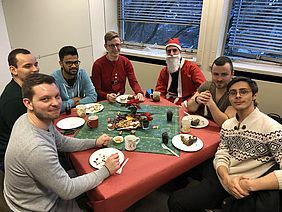 For the first time, we organized a “Best Christmas Outfit” contest. 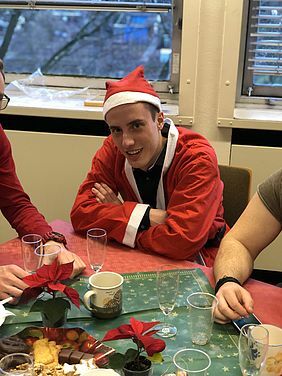 All participants voted Arndt Ziemons in his festive appearance as a winner. Three completed student research projects and one project work from Ramandeep Mandia, Wie Fan, Bo Zou, and Kevin Bissa. Additionally, we had the pleasure to welcome Prof. Lapovok (Deakin University) and Prof. Belyakov (Belgorod State University) to the IMM. We give thanks for their visit and to Prof. Molodov for taking care of our guests. We look forward to a continuous cooperation. Lastly, we express our gratitude towards our employees, students, friends and sponsors for their dedication to the institute and their research contributions. 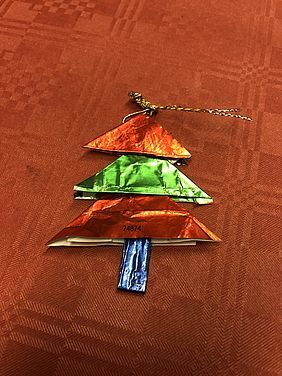 We wish everyone a Merry Christmas and a Happy New Year 2019.